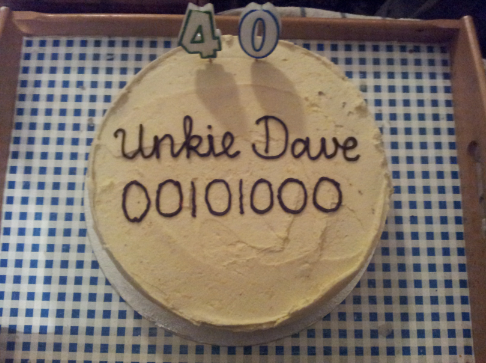 This week I have mostly been... turning 40. For many months now I have been languishing around in the wrong end of my thirties, and while you may think that this has depressed me somewhat, in fact I have been altogether rather neutral about the matter. 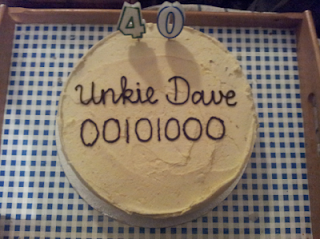 This is not due to any deep excitement over the prospect of entering my fifth decade, rather it is a legacy effect of all the major freak-outs that I experienced in the past when turning twenty-three, twenty-eight, thirty and possibly thirty-four. Maybe also thirty-eight. By the time this week and the Big Four-Oh rolled around, there was simply no chronological angst left in my system, and I was forced to enter a Zen-like state of calm and acceptance. Worryingly, on Friday as I read John Waters' latest piece in the Irish Times, wherein he referenced both Nicholas Carr's The Shallows (one of my favourite pop-sci/tech reads of the last few years) to bemoan the negative effects on the human mind of the transitory online world, and Umberto Eco to promote the value of the book over the internets (an argument not unfamiliar to me), I found myself nodding along in agreement as opposed to my usual feelings of uncontrollable and violently explosive nausea. And that's when the cold sweats set in. Is this how it happens? Not with a gradual and almost imperceptible decline in to social conservatism but with a sudden Logan's Run red light exploding in your head, you go to bed one night singing The Internationale and wake up the next morning at a Vigil4Life rally with a headscarf around your head, a priest on your arm and a very professional looking placard in your hand funded by shadowy US organisations who run a good sideline in populating the comments sections of Irish media websites with inflammatory hate speech. If so my RSS subscriber numbers will experience a pretty drastic tumble in the coming weeks. On the other hand my new bestest friends will no doubt be able to convince the meeja that I have 30,000 subscribers, instead of 4 pensioners and a morally bankrupt bishop on day release. But hopefully it will not come to this. So let us assume that like a broken clock even Waters is right twice a day, and that this longitudinal milestone will see none of my militant fury weakened nor my poorly spelled polemics blunted or diminished. To paraphrase Enobarbus in Anthony and Cleopatra, "Age cannot wither me, nor custom stale, my infinite variety (of wrath, bile and ire)".